Bucks In Turmoil.... ~ The Bucky Channel - The World of Sports from Wisconsin's Perspective. I realize that message board banter is usually speculation, opinionated and mindless drivel, but I thought this post was incredible. If true, I'm actually horrified by the Bucks current situation. Message Board Insider. I am fully convinced that if this post is true that Coach K has no control, and needs to go. Sen. Herb Kohl needs to sell the team to Bridgeman and a group of people who will keep the team in Milwaukee. Mo Williams needs to get out of Milwaukee now! 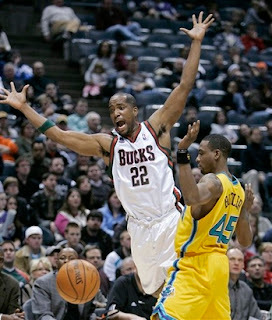 Even Michael Redd just seems dissappointed dejected and has seemingly given up. As far as I'm concerned the Bucks should only keep Andrew Bogut, Yi Jianlian, and Desmond Mason as a solid bench contributor. Jake Voskuhl too because I think hes a good locker room guy. When watching the Bucks I usually laud Voskuhl's bench cheering and motivation. While it is funny to see him always horsing around and being the first one off the bench during a big play or a timeout, it is refreshing to see in the NBA. As the last player off the bench for the Bucks I feel like he is great peice. Plus he hardly plays anyway. Other than those four guys, blow it up. I really, really hope this isn't true, but I fear that it probably is.